I have two very different children. My daughter, the first born, is naturally extroverted and gets energy from being around people. She’s never met a stranger, and she enters new places with no fear at all. My son, on the other hand, is slow to warm up, needs time by himself daily, and watches other kids interact for a while before he enters the play in a new spot. What works for one doesn’t work for the other. It’s so true! We need to adjust our parenting styles depending on our children. I’ve seen that with my two children in terms of what we focus on to help them learn to cope with stress. My daughter copes in very different ways than my son. As parents, we are busy and as we go about our day to day tasks, we can lose sight of our children’s individual needs. We need to remember to respect and work with our child’s personality. Sometimes, kids have difficulty identifying what they are feeling or have trouble learning what to do when they have those feelings. The Happy Kid Handbook has so many ideas for fun, useful activities for kids and families to do to encourage conversations about feelings. I believe, as the author mentions, that play “plays a crucial role in social, emotional and cognitive growth”. Play is necessary for kids to learn to negotiate, take turns, compromise, work as a team and make decisions. Play is the way kids interact with the world, and lessons learned through play tend to make a more lasting impact. Just as important is the fact that play is a natural way for kids to relieve stress. After a long taxing day at school, taking a break and playing can be a fantastic way for kids to transition into a more relaxed after school mode. Learning coping skills makes a difference. 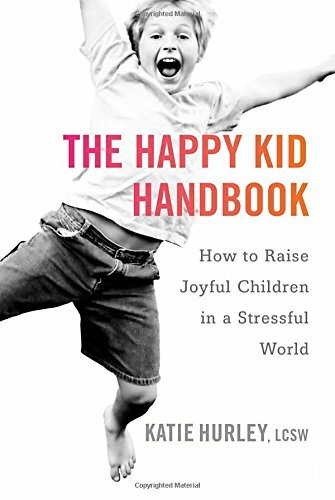 If you’re looking for playful ideas and inspiration for family time to build your child’s emotional intelligence and understanding, this book is a great place to begin.